Making homemade raspberry extract uses the same technique as making raspberry-infused vodka except you repeat the process several times to concentrate the flavor. Before centrifuges, distillers and micron filters made fruit extracts readily available, home cooks used solvent extractions, or alcohol tinctures, to pull the esters -- the chemicals responsible for a plant's flavor and aroma -- from the fruit and concentrate them. You can extract the flavor and aroma from raspberries with a 100-proof or higher vodka, using a steeping and filtering process that requires only a few hours of total active prep time. Pick through the raspberries and discard any with blemishes or damage. Rinse the raspberries under cool running water. Bring a pot of water to a boil and fill a bowl with ice and pour water in it to cover. Blanch the raspberries in the boiling water for 15 seconds then transfer them to the ice bath using a slotted spoon. Chill the raspberries for about 30 seconds. Drain the raspberries on paper towels and pat them dry. Pour the raspberries in a pint jar to the neck. Muddle, or crush, the raspberries with a long-handled, non-wooden spoon or similar food-safe utensil. You can use the handle of a wooden spoon, but it will be permanently stained pink. Add more raspberries and muddle them until the jar is one-half to three-fourths full. Pour room-temperature vodka over the raspberries until covered. 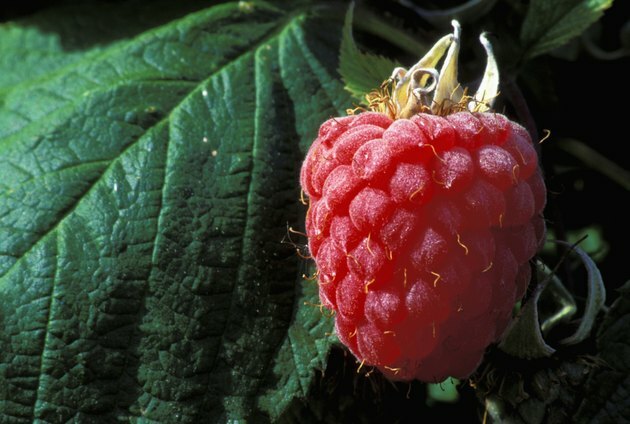 Seal the lid on the jar of raspberries and place it in cool, dry place out of direct sunlight. Shake the jar of raspberries vigorously every day. Continue this for three weeks. Open the jar of raspberries after three weeks and place a sieve, lined with cheesecloth, over a bowl. Pour the raspberries and vodka into the sieve and let the liquid drain through. Press on the raspberry solids with the back of a spoon or a rubber spatula. Clean the pint jar and fill it one-half to three-fourths full with blanched raspberries. Muddle the raspberries as you did before. Place a funnel in the jar and insert a coffee filter in it. Strain the raspberry extract through the coffee filter and into the jar. Depending on how much fiber it has, you might have to change the coffee filter. Add enough vodka to cover the raspberries if needed. You lose a little vodka during straining. Seal the jar and let the raspberries steep another two to three weeks. Repeat the straining process with the cheesecloth and a coffee filter. Taste the raspberry extract. It should taste almost unbearably or raspberries and have a dark color. If it tastes weak, repeat the three-week extraction and straining process again. Store the raspberry extract in the cupboard. Raspberry extract keeps indefinitely. Don't use vodka fermented with potatoes or rye. Rye- and potato-fermented vodka still extract fruit esters, but not as efficiently as corn-, grain- or wheat-fermented vodka. How do I Make Homemade Raspberry Wine?